Manually tracking your fixed assets is error-prone and time consuming. Radley’s asset tracking software makes it easy to streamline this process. Keep track of your equipment, tools and more within manufacturing and distribution operations. Track everything from a single component to returnable transport items and specialized tools. Use Radley as a stand-alone solution or integrate to your ERP/business system. Gain control over your fixed assets. Contact a Radley Product Specialist today for your free consultation! Radley technology is configurable to meet your specific processes, workflows and industry requirements. Our easy-to-use software tracks all your assets! Manage and control critical assets from a single component to returnables and tools. Use as a stand-alone solution or integrate to your ERP/business system. Track and manage assets using one, easy to use tool. Maintain visibility and control of your assets, from location tracking to meeting requirements. Configure to meet your specific requirements. Supplement an existing system or introduce a comprehensive Asset Tracking solution. Let our expertise in software, hardware, bar code and RFID technology make your job easier. Radley can help you put in place a more simplified and efficient process. Radley Asset Tracking system is a scalable, flexible, cost-effective software solution. Improve your ability to track not just an asset’s location but evaluate its life cycle and value. As a result, you can make informed decisions about purchases, allocation and disposal. You’re not just buying software; you’re investing in a total Asset Tracking solution. Radley will assist you with a total solution. Radley provides an evaluation of your process, as well as install, testing and support. Then complete your solution with bar code labels, asset and RFID tags and hardware. Radley combines asset management with the latest security and data analytic features. All this in a user friendly application! The standard product provides many configuration options. For instance, set up field renaming, transaction prompts, user dashboard, & read only fields. Also choose from data drop downs, creating inventory status, item groups and more. Our menu driven user interface is straightforward and simple to use. Also, choose from options to users to personalize their view. Operate in over 10 different languages. Using built-in web API’s the software can integrate with many business systems. Upload asset images, files, documents, video, records and instructions. Configure permissions to control access to screens, data, transactions and organization levels. Also, integrate Windows Active Directory to enable single sign on features. Get custom reports without paying for customizations! Generate configurable reports from the standard library. Or use SQL Design Tools, Crystal Reports or Dev Express to create forms and reports. Then upload them into the systems reporting tool for everyday use. Configurable grids and exports to Excel as well as PDF, Word, HTML, etc. allow for quick access to data. Query every field within a screen. Then take advantage of built in wildcards to narrow down your search. Also, define, save and name frequently used searches. Then you can automatically run the reports when you open a screen or execute with a hot key. Radley software will collect the necessary data to perform transactions and inventory counts. This occurs when an asset moves through a read zone or when using a handheld device with an RFID reader. Let our experts help you determine if RFID is a cost-effective option for your unique process. Add the IntelliLabel Traceability module to link sub-assets to primary assets. As a result, you can perform many transactions at once. So you can capture and tack unlimited characteristics and details for an asset. Also, IntelliLabel allows multi-level containerization to build pallet/container relationships. Create and define tasks associated with an asset. Set an interval, then assign notification to a user to complete the task. View and report against the maintenance history to check usage and re-utilization. Integrate to PLC-enabled machinery to automatically collect machine data. 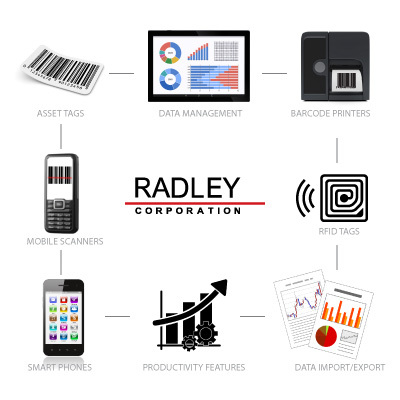 Incorporate barcodes through Radley’s inventory management system to track your physical assets. Scan an asset’s barcode label using a mobile computer to perform simplified transactions. Thus, eliminating manual efforts and decreasing human error. Configure transactions to prompt for specific data based on your process and requirements. Then store and track this data within the asset record. Quality barcode scanners and printers from Honeywell and Zebra will complete your solution. With concurrent user licensing, you can track unlimited assets and create unlimited users. Each software license includes a general data collection license. Radley Asset Tracking is an on-premise solution. It will run on a SQL Server 2008/Oracle database and requires a Windows Server 2008 operating system.